Every now and then, I like to take a step back and appreciate how far we’ve come in engineering and technology. Each time I do this I’m completely amazed that I can print things in plastic in my 3D printer, build robots that will follow my instructions and create my own rubber stamps in my laser cutter. I love the Maker and DIY cultures but also respect that we stand on the shoulders of giants. Without the discoveries of the past, we wouldn’t be where we are today. Below is a short list of famous women who have lead or are leading the way. Heather Knight is a pioneer in the growing field of social robotics which investigates ways in which robots could have an impact on our everyday lives. With degrees in electrical engineering and computer science, she is known as a social roboticist and is constantly thinking about new ways to make robots charismatic, giving them the necessary personality and social skills to interact with humans in meaningful ways. Dr. Catherine Mohr, a mechanical engineer, is developing the next generation of surgical robots and robotic procedures that allow patients to heal faster and better. She is pushing the boundaries of medicine with her research in robotic-assisted surgery. Ada Byron Lovelace collaborated with Charles Babbage, the Englishman credited with inventing the forerunner of the modern computer. She wrote a scientific paper in 1843 that anticipated the development of computer software (including the term software), artificial intelligence, and computer music. The U.S. Department of Defense computer language Ada is named for her. Amanda Theodosia Jones invented the vacuum method of food canning, completely changing the entire food processing industry. Before the 1800’s, a woman could not get a patent in her own name. A patent was considered property and women could not own property in most states. So, in a move typical of women inventors of the 19th century, Jones denied the idea came from her inventiveness, but rather from instructions received from her late brother from beyond the grave. Dr. Angela Moran, a materials engineering scientist, conducts research to help assure that metals and other material that make up some the Navy’s most vital equipment (such as aircraft, sea vessels and weaponry) can withstand the stress and demands of their use. Mary Engle Pennington revolutionized food delivery with her invention of an insulated train car cooled with ice beds, allowing the long-distance transportation of perishable food for the first time. Mary Anderson invented the windshield wiper in 1903. By 1916 they were standard equipment on all American cars. Beulah Louise Henry was known as ‘the Lady Edison’ for the many inventions she patented in the 1920’s and 1930’s. Her inventions included a bobbinless lockstitch sewing machine, a doll with bendable arms, a vacuum ice cream freezer, a doll with a radio inside, and a typewriter that made multiple copies without carbon paper. Henry founded manufacturing companies to produce her creations and made an enormous fortune in the process. Hedy Lamarr, a 1940’s actress, invented a sophisticated and unique anti-jamming device for use against Nazi radar. While the U.S. War Department rejected her design, years after her patent had expired, Sylvania adapted the design for a device that today speeds satellite communications around the world. Lamarr received no money, recognition, or credit. Grace Murray Hopper, a Rear Admiral in the U.S. Navy, developed COBOL, one of the first high-level computer languages. Hopper is also the person who, upon discovering a moth that had jammed the works of an early computer, popularized the term “bug.” In 1991, Hopper became the first woman, as an individual, to receive the National Medal of Technology. One of the Navy’s destroyers, the U.S.S. Hopper, is named for her. Stephanie Kwoleks discovered a polyamide solvent in 1966 that led to the production of “Kevlar,” the crucial component used in canoe hulls, auto bodies and, perhaps most importantly, bulletproof vests. Ruth Handler was best known as the inventor of the Barbie doll, also created the first prosthesis for mastectomy patients. Dr. Bonnie J. Dunbar helped to develop the ceramic tiles that enable the space shuttle to survive re-entry. In 1985, she had an opportunity to test those tiles first hand as an astronaut aboard the shuttle. I read the article below at first nodding my head in agreement. After a few minutes, I came to realize that while the message may be true for some girls, it’s not true for all. Marketing engineering, technology and computer science careers to women is not a one size fits all prospect. The article states that we use pink, curly fonts, and butterflies too much to bridge the gender divide. That we assume we need to turn technology into something girly to make it attractive. 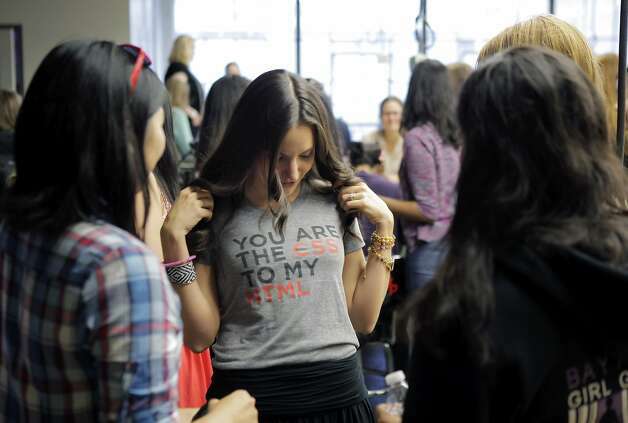 How not to attract women to coding: Make tech pink – SFGate. I personally can relate to this. I grew up in the SF Bay Area and was not attracted to pink media. I was much happier playing with my brother’s LEGO than Barbie and I wouldn’t have been attracted to pink LEGO either. I wanted to be taken seriously and knew that wouldn’t happen if my game wasn’t on the same field as all the boys on the block. As I grew older and gained confidence, I became much more attracted to color. Today, I prefer the teal, purple and tangerine LEGO blocks. Is that because I understand that I don’t have to be like the boys to make a valuable contribution? That different contributions are not less valuable? From promoting engineering all over the country and facilitating over 80 Mother/Daughter TEA Workshops (engineering events for Mother and Daughters) I can say, without equivocation, that one size does not fit all. Some girls love fancy script and a girly atmosphere and some prefer a gender neutral environment. This also varies greatly by geography and community. The best approach to reaching girls is to know your community and have a sense for what is interesting, what has worked in the past and what hasn’t been tried. If pink flyers with curly fonts work in your community, keep using them. If you find you aren’t getting enough girls to sign up for your program(s), change how you market. Just like engineering design, marketing is also an evolving process. What worked last year might not work this year. Test your messages, evaluate and redesign if necessary. What started you on the path to engineering or your current career? Can you identify a moment, person or thing that made you change lanes, take a turn or stopped you in your tracks? Last year, I gave a keynote in Kansas City for Science Pioneers. 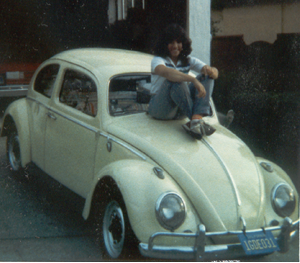 A few minutes into it, I talked about my first car – how much fun it was to try to fix it, the book that made it possible, the Flower Power mechanics and how I knew I wanted a cleaner and more diverse career. That car was a 1962 VW Bug and lead to one of the biggest ah-ha moments in my life. From wanting it to drive better, I learned that I had mechanical aptitude, I could rebuild an engine if the instructions were good enough, troubleshooting was fun, and a book could change your life. 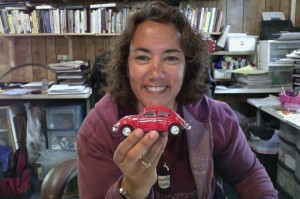 Last week, to my delight, a small box that contained a shiny red VW Bug came in the mail. As I looked at it and took my trip down memory lane, I remembered how much that car inspired me. Without that experience, how would I have discovered my mechanical ability? Would I have this love affair with books? Would I be writing this today without that experience? Thank you Paul for reminding me about how I got here and encouraging me to continue my own journey. We are all inspired to become who we are by something or someone. Make some time for yourself to remember, appreciate and share the experience. You never know who you may inspire with your story. 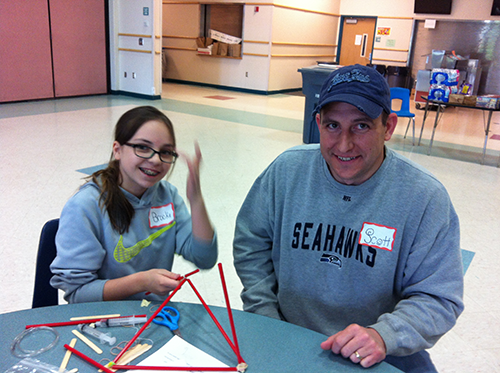 Last weekend I had the privilege of facilitating an Engineering Exploration Day for a school district in Washington State. If you follow my work you know about the Mother Daughter TEA (Technology Engineering Aptitude) workshops. 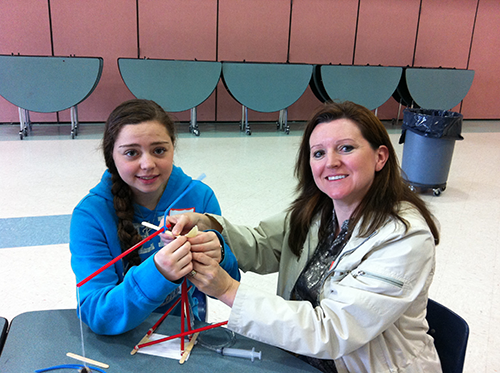 In the Mother Daughter TEA workshop, Moms and their middle school daughters complete engineering projects together and learn about valuable, high-wage opportunities in the engineering industry. They hear about how women are impacting the field and get insight into career opportunities they may enjoy. The Mother/ Daughter TEA event was founded to encourage young women to take an interest in pursuing a career in engineering. Every year, I hear from parents that also want their boys to have the same opportunity. As a result, last weekend we debuted “Engineering Exploration Day.” In this workshop, we had middle school girls and boys, moms and dads. We stuck to the same model of four hours on Saturday morning and built cranes, flingers and boats. The workshop moved along quickly and everyone stayed engaged. We had a great time. If you are trying to recruit for your GTT, STEM 101 or any other engineering classes, this is a great workshop to hold because by the end of it, you’ll have the parental support at home that is so critical to students making good choices. Big news today! At long last, Passport to Engineering is here! Passport to Engineering will help students understand engineering and engineering technology in a whole new way. In Passport to Engineering, students will watch a short video on a specific discipline, take a short test and when they pass the test, they’ll receive a stamp in their passport. Get all 33 stamps and they’ll receive a certificate of travel proving that they’ve been to all of the engineering and engineering technology destinations. discipline specific puzzles and games. Flights based on what you like to do – this option offers career track suggestions. A personality test to gauge if engineering is a good fit. An academic challenge to gauge your academic readiness. Engineering career books for further investigation. Engineering videos (Engineers Can Do Anything, Women in Engineering and The Road Ahead). Online Access – This option allows you to get going right away. Purchase courses individually or as a package. Covers 33 different types of engineering and engineering technology. Two free courses can get you started quickly. The reasons that we hold events, competitions or camps may often seem so obvious – we want to recruit into our programs or schools or lead students toward their untapped potential (a.k.a. – a better future). 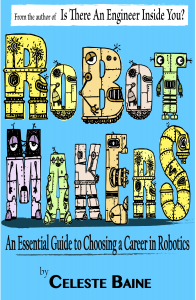 I read that robotics has become so popular because it’s an integrated and engaging approach to all things STEM plus teamwork, problem solving, collaboration, and innovation. It’s difficult to measure your program’s success with middle school students because they are so far from college. Without diligent tracking, you may never know if your program influenced them to pursue a STEM education. The softer reasons that we hold events are also because we want to tell students that we believe in them or that we believe they can do it. It’s great for their self-esteem to know that they have a champion on their side. When you believe in yourself and your abilities, what is there to stop you from doing exactly what you want with your life and making the perfect career for yourself? I’ve received many emails lately about Engineers Week and what it’s all about. To briefly summarize, Engineers Week (Eweek) is always during the president’s birthday week. So this year, it’s Feb. 16-22. Eweek statistics show that last year, 40,000 engineers visited classrooms to educate students about the field of engineering. Eweek extrapolates that those engineers reached 5 million students! There are only 20 days until Eweek and it’s not too late to get involved. Below, I have provided suggestions for teachers to use Eweek as a special time to really educate, inspire, motivate and/or cajole interest in engineering. It’s a time to celebrate the profession and the amazing advances and achievements of the field. It’s also the perfect opportunity to get people to help you in this mission. Five things that teachers can do right now. The first thing I would recommend to get an engineer to come to your classroom is to open the phone book and call a local firm that has a yellow page ad. Explain that you are a teacher and would like an engineer to talk to your kids for Engineers Week. You can give them the link to Eweek (www.discovere.org). Most firms benefit from the exposure so you might be surprised at the results. If they seem resistant, just try another. Put your state in the search engine to find local events in your area. There is a good chance that in a classroom of 30 students, at least one or two will have parents that are engineers. You may be able to get the parent engineers to talk to your class. Call your local college of engineering and see if you can arrange a tour or see if they are doing anything special to celebrate the week. Don’t forget about junior colleges and vocational schools! They are also great resources. Contact your local engineering society to find out what they are doing. For example, the IEEE, ASME, ASCE, NSPE and many others have state branches that are independently run by engineers in your state. This may be an excellent opportunity to make a lasting connection. Just put (ieee.org) or (asme.org) or (asce.org) or (nspe.org) into your browser and search for local or state chapters of the organization. When you find your state contact, write to the president asking for help. What are you doing for Eweek? Questions, suggestions? Post them here! What does an engineer look like? You can put on a lab coat and people automatically think doctor or scientist. A headset implies telephone operator, sales person or receptionist. A space suit screams Astronaut. Pilots, firefighters, police people, photographers, teachers, construction people, farmers and many other occupations have a certain “look”. But what does an engineer look like? One problem with determining “the look” is that the field is so broad. Engineers design, manufacture, build, research, write, investigate and present their findings. It’s easy to think of engineers designing rides at Disney or crawling around inside of a bridge to check for stress cracks. We know what that looks like but what about the engineers that don’t design things? How do we show an engineer that is checking air quality or researching new and safer ways to dispose of compact fluorescent light bulbs? Is anyone having a fashion/runway show for eweek next month? Get Ready for Engineers Week! Now that the holidays are behind us, the next big celebration on my calendar is Engineers Week (eweek). Because I run a center that is based on promoting engineering, this is a big deal. In fact, it’s such a big deal that I talk about it all year. If I facilitate a training, those teachers hear about it. If I talk to engineers about mentoring, they also hear about it. I blog about it and sometimes throw eweek parties. The reason I get so excited about Engineers Week is because I get the chance to celebrate the profession with thousands of like-minded people all over the world. The point is to do something to celebrate. The week runs from Feb 16-22. This is your chance. Last Friday was the conclusion to our 2013 Engineering Innovation poster contest. The purpose of the contest was for students to design posters that will motivate and inspire their peers to consider an engineering career. We had 149 thoughtful, creative and imaginative entries. I feel like a broken record but the judging has become more difficult each year. With the push in schools for hands-on and project-based learning, engineering has gained a toe hold in classrooms across the world. Students are getting it. They have a much better idea about what engineers do and can also visually express their ideas with strong images, colors and statements. I’m proud that we run this contest annually. It’s always fun to see all the ideas and provide a conduit for students to inspire each other. Teachers demonstrating their prosthetic hand design. Last week, I gave an interactive keynote for Science Pioneers in Kansas City. We talked about the Next Generation Science Standards (NGSS) along with engineering design while they creatively designed, modeled, evaluated and optimized two projects from Teaching Engineering Made Easy. The 200 teachers in attendance were exceptional students in that they embraced the projects and kept evaluating and optimizing if their designs weren’t turning out as expected – and they did this with a smile on their face. The activities within Teaching Engineering Made Easy are a great introduction to teaching engineering design because they do not require a formal science lab and they integrate well with the Disciplinary Core Ideas of the NGSS. Students will identify needs, define problems (ETS1.A), identify design criteria and constraints, brainstorm solutions (ETS1.B), evaluate their solutions (ETS1.C) and optimize their designs (ETS1.D). Teaching Engineering Made Easy; A Friendly Introduction to Engineering Activities for Middle School Teachers (Volumes 1 and 2) are books of 20 engineering activities designed to introduce both teachers and students to the world of technology and engineering. 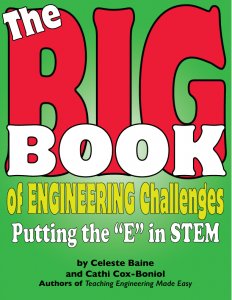 Developed to help middle school teachers with no engineering background teach engineering, these easy and exciting, time and work saving books can be used in the classroom, an informal science environment, to enhance an event or competition, at an engineering camp or any other educational setting. They offer a ready collection of projects, lessons and activities to help teachers stimulate student’s thought processes and get them thinking like an engineer. By using these teaching guides, students can see that engineering is not something to be afraid of but a realistic way to solve the problems of everyday life. The activities do not require a formal science lab and can be done with materials that are inexpensive and easy to find. Activities range from 20-minute problem solving exercises to several class period design or “challenge” activities. 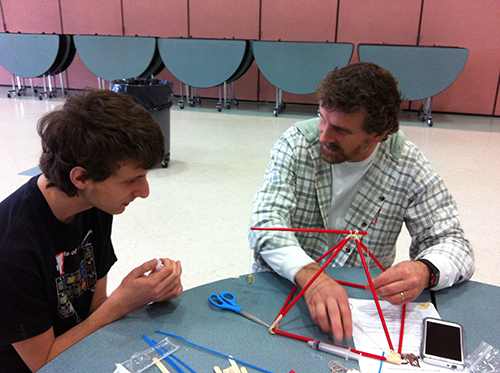 The challenge activities integrate perfectly with the Disciplinary Core Ideas of the NGSS. Engineering challenges are design problems that require students to identify needs, define problems (ETS1.A), identify design criteria and constraints, develop solutions (ETS1.B), and evaluate their solutions (ETS1.C). In these activities, there are more than one “right” answer. In a class of 10 student teams, you will often see 10 different designs that all meet the design criteria. The right design is usually one that meets the engineering criteria and is built within the materials budget. 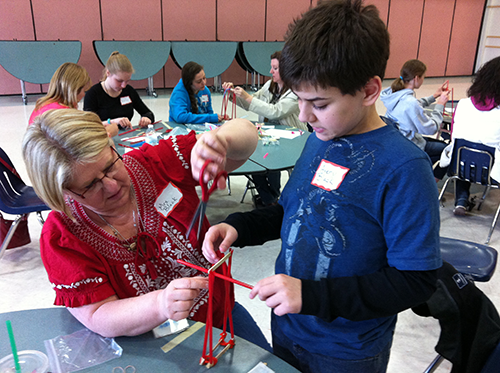 Students will design, construct, and test their engineering design solution and collect relevant data (if applicable). They will then evaluate the solution in terms of design and performance criteria, constraints, priorities, and trade-offs while also identifying possible design improvements. EESC’s 9th Annual Engineering Poster Contest Kickoff! The theme for the EESC’s 2013 poster contest is Engineering Innovation. You may enter up to three times. Posters should be fun, motivational, and inspire students to pursue a degree in Engineering, Engineering Technology or any other STEM (Science, Technology, Engineering and Math) field. Most people don’t describe engineers as creative. Many people equate the word “creative” with being artists or writers. Engineers are just like artists except with a practical twist. They see a problem and apply creativity to find a solution. Because consumers decided vacuuming was a problem, now we have the Roomba iRobot vacuum cleaner that automatically vacuums or mops floors while you do something more enjoyable. New homes often have vacuuming systems already installed in the walls or self-vacuuming kitchens, and Dyson engineers are always trying to design a better vacuum cleaner. In fact, a look at the advanced cleaning systems over the last 10 years further indicate just how frequently engineers are employed to find better and more innovative cleaning solutions. Scrubbing Bubbles self-cleans your bathtub daily, the Swifter wants to mop your kitchen, and portable power-washers allow the average consumer to clean the exterior of their home and property without any other special equipment. Think about a world without dishwashers, microwave ovens, washing machines, dryers, refrigerators or freezers. Without engineers, so many day-to-day chores would be much harder. On other technology fronts, engineers are the ones who figure out how to make a roller coaster careen forward at 120mph in four seconds without injury. They are the ones who figure out how to make cars run on electricity or fuel cell technology to keep our atmosphere cleaner. They create medical equipment used by doctors to keep us healthy, and even work in the food industry to make foods such as chocolate and cereal taste better. Engineers have given us digital music, email and communications that fit into our pocket, and are hard at work to help save endangered animals from extinction, improve our environment and increase our safety. Problem-solving has been the path by which some of the most amazing inventions and technologies have arrived in the market today. These inventions exist because one engineer had an idea. Look back at old pictures of the bicycle. People wanted the bicycle to go faster, to go up and down mountains and be more comfortable. The difference now is due to engineering. So that bikes could go off-road and through trails, engineers designed lightweight and stronger frames, along with shock absorbers, forks and wheels to take the punishment of off-road riding. When the cost of gas rose so much that more people wanted to ride bikes to work or school, engineers created a lightweight folding bicycle that could be carried into an office and unobtrusively stored or put into a school locker. When a faster bike was needed to win the Tour de France, engineers designed that too. Each year, engineers have gone back to the drawing board and made bicycles better. What will bicycles look like in another ten years? The future engineering workforce has the capacity to make the world a better place where people are safer, have more fun and can do more. A few weeks ago, I ran a summer camp in Tulsa that simultaneously trained 10 teachers on engineering design while also serving as a summer camp for 34 middle school girls. How it worked: On Monday, teachers learned several activities while the girls did ice breakers, watched videos and were entertained by other facilitators and several engineering students from the local colleges and high school (PLTW and robotics students). On Tuesday – Friday, the teachers, armed with the activities they learned and constructed on Monday, team facilitated the activities with the girls. When the girls had a field trip to local industry, watched videos, or listened to panel discussions (basically every spare moment), the teachers went back into training. When the girls went home, we refined our activities and hashed out what worked and what didn’t. It was an amazing week lead by amazing people! By the last day, 95% of the girls said they wanted to be an engineer and the teachers went back to class with increased confidence and bundles of materials to implement more engineering education into their instruction. Inspirational message: Never underestimate the power of a full engaged and committed team of people. They can and will do amazing work! This year, when getting ready to launch the poster contest I decided to do some snooping around on Facebook to see if past high school poster contest winners were in engineering school now. To my delight, 4 of 5 that I searched for were definitely enrolled! It’s a small sample but still noteworthy. Researching engineering careers and producing a visual representation of that research stimulates an increased interest in the field. Contestants may learned things about engineering they didn’t know before. Students that win have been interested in engineering and that enables them to produce more thoughtful posters. Because many classes in numerous schools enter the contest as a class assignment, this may produce a collective consciousness about engineering that contains more information about possible careers than would be possible otherwise. Whatever the case, I’m happy to see that this contest is making an impact! EESC’s 8th Annual Poster Contest Kickoff! The EESC’s 2012 poster contest will include two themes. Contestants may enter one or both up to three times. Posters should be fun, motivational and inspire students to pursue a degree in STEM (Science, Technology, Engineering and Math). Category 1: “Grand Challenges for Engineering” – This theme is back for another round! Throughout human history, engineering has driven the advance of civilization. In the last century, engineering recorded its grandest accomplishments. The widespread development and distribution of electricity and clean water, automobiles and airplanes, radio and television, spacecraft and lasers, antibiotics and medical imaging, and computers and the Internet are just some of the highlights from a century in which engineering revolutionized and improved virtually every aspect of human life. For all of these advances, though, the century ahead poses formidable challenges. As the population grows and its needs and desires expand, the problem of sustaining civilization’s continuing advancement, while still improving the quality of life, is more immediate. Old and new threats to personal and public health demand more effective and more readily available treatments. Vulnerabilities to pandemic diseases, terrorist violence, and natural disasters require serious searches for new methods of protection and prevention. And products and processes that enhance the joy of living remain a top priority of engineering innovation. Category 2: “Women in STEM” – More women in the STEM workforce is vital to innovation, our economy and global competitiveness. Every day, inspiring women in a variety of STEM careers make a difference in the world. STEM literacy is a requirement in the 21st and possibly the best ticket to a good job, meaningful career, and a secure future. The engineering activity book, Teaching Engineering Made Easy: A Friendly Introduction to Engineering Activities for Middle School Teachers is being released in an 2nd edition! Updated and improved, it features activities for Chemical, Civil and Mechanical Engineering as well as team building and problem solving too. Each type of engineering also includes content on engineering careers so that you can inspire students to do their best by showing them not only how much money they can make right out of college but also what they can do with an engineering education (if desired, these pages are also reproducible as student handouts). By using this teaching guide, students can see that engineering is not something to be afraid of but a realistic way to solve the problems of everyday life. This easy and exciting time and work saving book was developed to help middle and high school teachers with no engineering background teach engineering. It gives classroom teachers an easy and dynamic way to meet curriculum standards and competencies. You’ll find the lessons and activities to actively engage students in learning about engineering and our technological world by applying creativity and innovation as they complete the projects. The activities do not require a formal science lab and can be done with materials that are inexpensive and easy to find. Each lesson includes background information, ITEEA and NSTA Standards Alignment, a list of materials needed to complete the activity, an easy-to-follow procedure for presenting the lesson, teacher notes, reproducible student sheets, and safety notes. Activities range from 20 minute problem solving exercises to several class period design or “challenge” activities. Because I want you to be successful in the classroom, I have a few special offers. 1. For every educator that orders this new edition before the publication date, you will also receive three PowerPoint presentations that you can use in class to explain about chemical, civil and mechanical engineering careers. They are colorful, engaging, and designed to save you time. 2. A few years, ago, I wrote a book called, Engineers Make a Difference: Motivating Students to Pursue an Engineering Education with a Foreword by Cary Sneider. Because these books go hand-in-hand, everyone will receive a rebate certificate to receive a free copy! When you receive your order of Teaching Engineering Made Easy, just fill out the rebate certificate and mail it to us. We’ll ship your copy of Engineers Make a Difference right away for free. 3. Last but not least, we have created several new activities for this new edition. I wanted the book to be more dynamic and fun. I prefer projects that are visual, make noise, fly, and move, so this updated edition reflects my passion in building. However, in the end, I found that we had several “spare” activities that are really good but we couldn’t fit them in the update. I’ve decided that everyone who purchases the new book will also receive all of the spare activities for free. So order this updated and improved second edition today! You’ll receive three PowerPoint presentations (for Chemical, Civil and Mechanical engineering careers), a free copy of Engineers Make a Difference and a stash of extra engineering activities. You really can’t lose! You can read the reviews, see the table of contents and watch my video trailer online. Thanks for what you are doing to get kids interested in engineering!